Welcome to Victorian Christmas Past. Take a virtual tour of historic mansions and churches that have been a part of Victorian Christmas celebrations in Williamsport, Pennsylvania. Description: This circa 1890 Victorian style home with wrap around porch, functioned as a convent in the 1970s for the sisters from the Diocese of Scranton serving at St Boniface Church. Although the original porch floor has been replaced the beautiful interior woodwork remains unaltered. Copies of the home’s old deeds will be on display as well as numerous artisan hand made and antique quilts. Family members will be present to discuss their hand made quilts. Description: Owned by the Mieles of the Herdic House Restaurant, this beautifully maintained home is now a Bed & Breakfast Inn. The house contains many original gas light fixtures including an ornate dining room light. Note the stained glass window at the top of the stairs, the rounded panes in the turret, and the servant call system in the kitchen. Description: This magnificent 1888 Queen Ann Victorian home was designed by Eber Culver and built on land purchased by Peter Herdic. From an originality standpoint, craftsmanship and overall condition this home truly exemplifies Millionaire’s Row. Nothing was spared by multimillionaire Edwin A Rowley when he built this imposing structure which features extraordinary Tiffany quality stained glass windows, beautiful cherry and oak woodwork, and extremely rare electric light fixtures. Description: This is a spectacular brick home in the French Normandy style. It was designed by the well known architect Carl Tallman in the late 1920s. The exterior of the house is completely original and in excellent condition. The interior features a newly remodeled kitchen, handsome fireplaces, a spiral staircase ascending the tower and former servant’s quarters which consist of sitting room, bath, bedroom and its own porch. Description: This Late Victorian Queen Ann is completely custom designed with a colonial revival influence. The outside of the house is original and boasts many stylistic features not found in the typical pattern book of the time. The house was designed in 1890 by Amos Wagner and built for Henry Johnson, a state legislator from Muncy. Johnson moved to the city to help his six daughters find suitable husbands among the wealthy men of Williamsport. The Johnsons were so pleased with Wagner’s work they had him build a similar home next door on Maynard Street for one of their daughters! This home has been beautifully renovated into a Bed and Breakfast with 5 unique rooms each with their own private bath, a sitting room and an executive boardroom. The third floor offers a furnished apartment for extended-stay guests. Description: This is a1915 late Victorian style home with Mission influences. It features a “four square” design with half brick and half wood shingles, large front and side porches as well as a porch on the 2nd floor. The dining room with its handsome wainscoting has some of the original light fixtures. Description: Formerly the Goodrich-Walker House, it was built in the mid 1880’s by John Goodrich. The house is English High Victorian-Gothic and is one of the finest on Millionaire’s Row. Once the social center of Williamsport, it was the home of Anne Weightman Walker Penfield who, after inheriting her father, William Weighman’s estate and quinine fortune, was considered one of the richest women in the world. Its carriage house, with its fairytale facade, is the only carriage house in town with the original horse stalls. You can still see the winding stairs that led to the carriage keeper’s quarters. Description: Built in 1930 this true Georgian Colonial was home to the Maynard family for 20 years. This Georgian style is evidenced by the cornices along the roof lines and the keystones over the windows, The original construction featured a slate roof with copper gutters and downspouts, along with a gas fired incinerator in the pantry and oil heat, which was not very common 80 years ago. This home has great proportions and a gracious floor plan. This is a remarkable “turn of the century” house with stunning architectural details: wraparound porch, elegant columns, leaded glass windows, coffered ceilings, pocket doors and prom staircase. A Grampian treasure, with a third floor bedroom that is a child’s dream. A distinctive Italianate style Victorian home, defined by stucco walls with coinstone corners, large protruding eaves, heavy cornices decorated with double corbels, and wonderful curved arches above each window. The windows themselves retain the original curved mullions separating each window into decorative panes. This house was built between 1865 and 1875, which was the peak of Italianate Villa architecture. From an originality standpoint and condition, this circa 1888 home is one of the most significant Queen Anne Victorian Houses in Pennsylvania. During the tour, Mr. Kane will present a slide presentation in the Nassberg Media Room on architecturally-significant homes in the Williamsport area. Owner: Preservation Williamsport • Chair: Robert Kane, Rowley House Curator Florist: Strawberry Basket, eliz Snyder • Sponsor: Penn Square Apts. This home and accompanying carriage house, built in 1887 by architect Eber Culver, is an outstanding example of Queen Anne craftsmanship, especially the cherry wainscoting in the foyer and front hall as well as three floors of cherry stairway railings. The house has undergone considerable restoration, most recently the exterior and dining room. Featured in the carriage house is a 1929 Packard limousine. This charming 1937 home was designed as a Pennsylvania farmhouse by renowned architect, R. Brognard Okie. The façade is primarily undressed field stone and mortar in the English tradition. Throughout the home, one sees magnificent cherry wood trim and planked pine flooring. The multiple dormers, blind window shutters and shingle style roof help to capture the English country feel of this home. Visitors to the Lycoming County Historical Society will be enchanted with a display of late 19th – early 20th century dolls, miniature furniture and selected toys. The exhibit will feature the doll collection of Margaret Myers Lamade (Mrs. Dietrick Wilson), donated to the museum in 1993. Guests may also stroll through the fine arts gallery, which features works by Severin Roesen, J. Wesley Little, and John Sloan. They will be swept back in time by viewing the recreated frontier room, the Greek Revival Parlor, and the Ralston General Store. Also, visitors may explore the dynamic history of the region’s American Indian culture, the military heritage of the county and the logging and lumbering industry of the 19th century. And what a visit to the LCHS would be complete without viewing the LaRue Shempp Toy Train Collection. This beautiful New England Colonial frame house built in 1924 by architect Carl Tallman, features a traditional center hall plan with gum paneling in the living room and exquisite paneling in the dining room. Stained glass windows adorn the center staircase with views of the newly landscaped patio and gardens. This is a classic 1920’s Art Deco house. It is defined by period-appropriate brass entry doors, stucco exterior walls and an exposed brick foundation. The overall boxy style accented with curved corners, curved balcony, and tall narrow windows all add to the Deco period feel of this home. Built in 1997, this spectacular house reflects the Italian Villa style with a sprawling country club like setting. The dining room boasts a hand painted mural, depicting Christ with five children, by artist Marguerite Bierman. African mahogany floors, cherry and mahogany carved fireplaces and a circular floating staircase are a few of the many unique characteristics. Additionally this home will feature some of the finest artisans showcasing their work which will be available for purchase. This landmark church was originally designed and built by Eber Culver in 1854. It has been served by 21 pastors and six interim pastors in three different buildings all on the same corner of ground donated by Peter Herdic. Peter’s wife was a member of the congregation. After being destroyed by floods, the original building was torn down in 1889. The main sanctuary was completed in 1914. The church is an example of the Romanesque style of architecture, with mountain stone quarried from this area. The present church is known for its beautiful sanctuary with the eight stained glass windows depicting Baptist patriarchs. The jewel of all the windows faces West Fourth Street and depicts the baptism of Jesus. Designed in London and built in New York City by Young and Bonawitz in 1914, the windows were taken apart to be transported to Williamsport. Built in 1886 by Amos Wagner on land donated by Peter Herdic, the church was built to service the Irish Catholic community. It is an example of the Romanesque style of architecture, and the sandstone came from the nearby Ralston Quarry. The church has a multi-gabled slate roof and walls with colored belt courses. There are 43 arched stained glass windows. The entryway and entry doors are semi-circular. The bell tower is open with a decorative cornice and patterned stone. The center tower was capped when three workers fell to their deaths during construction. The interior has marble altars and Tiffany windows, including “The Accession of Christ” behind the main altar installed in the early 1900s. Note the use of marble and gold. The church seats 1,000 people. Built in 1875 by Culver and Thorn, the church was paid for by Peter Herdic, who donated not only the land but also the entire building to Trinity Parish for one dollar as long as the pews remain “forever free.” His father-in-law, Judge Maynard, presented the church with the first set of nine-bell Westminster chimes in America, the same as heard in the Big Ben Tower of London. An example of English Gothic architecture, the church is built with stone quarried from Bald Eagle Mountain at Muncy and brownstone from Hummelstown. Note the pointed arches and windows, steeply pitched colored slate roof, and 265-foot spire. In an 1876 issue of the Parish Dial, the following passage appears concerning the church’s windows: “Words cannot paint the loveliness of these windows. The makers, Aickin and Isaac, Philadelphia, have conscientiously adhered to the true idea of glass staining, which does not consist in painting the various colors upon large sheets of glass, but in leading together separate pieces so as to present a transparent mosaic. The side windows show exquisite geometrical designs. This magnificent structure was built in 1878 as a commercial building with a huge Masonic lodge on the third floor. Matt Schauer, the current owner, purchased the building in 2005 and is in the process of transforming the spectacular top-floor space into a penthouse urban dweller’s dream for himself. Look for the polychromatic vaulted ceilings, the last surviving example of 1870’s painted interior decoration left in Williamsport. Also note the ornate brackets, medallions, and stained glass windows. Built in 1893 by Eber Culver, Old City Hall is now on the Pennsylvania Inventory of Historic Places as well as the National Historic Register. Each unique suite is architecturally charming with some suites retaining their original fireproof vaults. The interior is poshly decorated with luxurious marble tile floors, elegant stairways with magnificent balustrades, and a romantic veranda above the main door. In 1894, these extravagant details inspired the Gazette & Bulletin to write, “There is no church in Williamsport that will compare in elegance.” In the early 1980s and less than 100 years later, the building was saved from the wrecking ball by Richard H. Lundy. This notable example of Queen Anne style architecture was designed by Eber Culver in 1888 for Hiram Rhoads, the man who first brought the telephone to Williamsport. Among the many features are front doors with unusual stained glass design, hallway and staircase of hand-carved mahogany, five fireplaces, upstairs bathtub encased in mahogany, solid pecan floor in the living room, ornate gilded bronze hardware throughout, and the most magnificent chandeliers in Williamsport. The dining room has been newly redecorated, and the gourmet kitchen with its handsome tiles has been featured in Victorian Kitchens & Baths book and Victorian Homes Magazine. Historically known at the Smith/Ulman House and previously used as the rectory of Annunciation Church, this 1889 house with Italianate influence was built by Isaac Hobbs and is now the law firm of Raup, Wiley, and Mott. Look for the large brackets, heavy detail, and flared mansard roof. The Italianate features are the ornate mouldings, arched windows, and door hoods. This is the largest Second Empire in the Historic District. The interior is being beautifully restored to its original condition. Probably the most magnificent remaining example of the craftsmanship which exemplified Millionaire’s Row, this 1888 home was designed by Eber Culver and built on land purchased by Peter Herdic. It is recognized as one of the most outstanding examples of Queen Anne architecture in the state and features extraordinary Tiffany quality stained glass windows which were featured in Victorian Homes Magazine. The cherry and oak woodwork is in excellent condition, and the electric light fixtures are extremely rare. 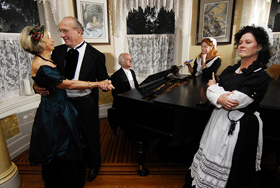 It was opened to the public as a Victorian House Museum summer 2007. Built in the early 1900’s by C. Luther and Carolyn Gates Culler, this gracious and elegant brick and stucco home with outside front fountain exemplifies the Georgian style of architecture. In the style of “The Great Gatsby,” it features tall arched, floor-to-ceiling windows, fourteen rooms, five bathrooms, and maid’s and chauffeur’s quarters. The $100,000 construction cost was a sizable amount for the era. Culler owned and operated the Culler Furniture Company in Williamsport, located at the foot of Susquehanna Street on the site of what is now the Pennsylvania College of Technology. The company’s primary product was chairs, and a symbolic Culler Chair stood on the roof of the building. Babe Ruth reportedly hit a home run over this chair during an exhibition game. This spectacular house has recently undergone extensive and detailed restoration by the present owner. Late Victorian Queen Anne, this home (also known as the Johnson/Lamade House) was completely custom designed with colonial revival influence. The outside of this house is original and boasts many stylistic features, such as double roof dormers with wood shingles and fish scale trim, that were not found in the typical pattern book of the time. It was designed in 1890 by Amos Wagner and built for Henry Johnson, a state legislator from Muncy, who moved to the city to help his six daughters find suitable husbands among the wealthy men of Williamsport. The Johnsons were so pleased with Wagner’s work, they had him build a similar home next door on Maynard Street for one of their daughters. The house is now a women’s museum of the 1800s. Built in 1885, this Eastlake-style brick has a gabled roof. The gables have clapboard and vertical board with an arched mullioned window on the second floor. The wrap-around porch has an arched entrance, turned posts, railing, and a mullioned sidelight by the door. This is one of the few homes on West Fourth Street that has never been converted into apartments but has always remained a single family home. Designed in compelling Arts and Crafts-style architecture, this home, features chestnut beams and woodwork, and stained glass. A mid-1900s chestnut blight destroyed most of the magnificent American chestnut trees, which makes this house and its woodwork so rare. Enjoy the 6-foot ceiling-to-floor doors in the 30-foot living room, which leads to the handsome 64-foot stone porch wrapping the front and sides of the house. This landmark church was originally designed and built by Eber Culver in 1854. It has been served by 21 pastors and six interim pastors in three different buildings all on the same corner of ground donated by Peter Herdic. Peter’s wife was a member of the congregation. After being destroyed by floods, the original building was torn down in 1889. The main sanctuary was completed in 1914. The church is an example of the Romanesque style of architecture, with mountain stone quarried from this area. The present church is known for its beautiful sanctuary with the eight stained glass windows depicting Baptist patriarchs. Designed in London and built in New York City, they were taken apart to be transported to Williamsport. Originally Church of the Covenant and more recently St. Paul’s Lutheran Church, this limestone structure has a center spire, bell tower, and steeply pitched roof with stone finials. The windows are pointed and arched. It has the largest expanse of Tiffany stained glass in Northcentral Pennsylvania. Note the arched entryway with decorative insets. Built in 1886 by Amos Wagner on land donated by Peter Herdic, the church was built to service the Irish Catholic community. It is an example of the Romanesque style of architecture, and the sandstone came from the nearby Ralston Quarry. The church has a multi-gabled slate roof and walls with colored belt courses. There are 43 arched stained glass windows. The entryway and entry doors are semi-circular. The bell tower is open with a decorative cornice and patterned stone. The center tower was capped when three workers fell to their deaths during construction. The interior has marble altars and Tiffany windows. Note the use of marble and gold. The church seats 1000 people. Built in 1875 by Culver and Thorn, the church was paid for by Peter Herdic, who donated not only the land but also the entire building to Trinity Parish for one dollar as long as the pews remain “forever free.” His father-in-law, Judge Maynard, presented the church with the first set of nine-bell Westminster chimes in America, the same as heard in the Big Ben Tower of London. An example of English Gothic architecture, the church is built with stone quarried from Bald Eagle Mountain at Muncy and brownstone from Hummelstown. Note the pointed arches and windows, steeply pitched colored slate roof, and 265-foot spire. Circa 1890’s Victorian Façade with contemporary adaptations, handsome woodwork handcrafted by James Wood Company. Mahogany bath tub on 3rd floor. Enhancing sky lights. Classic Queen Anne with steep gables. Many exterior ornamental features – turned posts, fretworks, Decorative shingles. Large classic Queen Anne Victorian with large gables and a predominate tower. The house is built of brick with shingle decoration. The design of this house shows subtle Richardsonian Romanesque details into its overall façade. Interior oak and mahogany paneling packet doors and brick fireplaces with wooden surrounds. Circa 1865 Built by Peter Herdic and sold to his accountant. Mr. LeVan is the 3rd owner. Second Empire style, deep cove moldings and center medallions in the interior Stylish double front doors with etched glass classic 2nd empire window cornices above each window. Original stucco. This styles hallmark is the flat roof with decorative slate roof sides with built in dormers. The Stroehmann Family residence owners. Spectacular brick house with tower in the French Norman influence. The house was designed by the well known Architect, Carl Tallman in the late 1920’s. The exterior of the house is completely original and in excellent condition. The inter features handsome fireplaces, butler’s pantry, fish pond and intriguing tower steps. Immerse yourself in local history at this intriguing museum, which charts the region’s past through exhibits and memorabilia. From frontier days to the booming era of the Lumber Barons, the museum highlights Williamsport ‘s fortunes and vagaries. Hundreds of model trains also find their share of fans; some even make their way about the facility. Additional displays showcase 19th-century paintings, various town buildings, and period furnishings. The Susquehanna River provided the means for Lycoming County ‘s explosive growth at the turn of the century. Come visit the Peter Herdic Transportation Museum and explore the rich traditions of the Susquehanna Valley from the time of the Susquehannock Indian Tribe to today’s modern transportation systems. From the birch bark canoe to a fully restored GMC 1962 bus, it’s an interesting tour back in time. PETER HERDIC TRANSPORTATION is behind Trinity Episcopal Church. Built 1886, Amos Wagner architect. The church has a multi-gabled slate roof and stonewalls with colored belt courses. There are forty-three arched stained glass windows. The entryway and entry doors are semi-circular. The bell tower is open with a decorative cornice and patterned stone. The center tower was capped when three workers fell to their deaths during construction. The interior has marble altars and Tiffany windows. Built on land donated by Peter Herdic, the local Irish community used Ralston Quarry sandstone to build this structure. Originally Church of the Covenant and more recently St. Paul’s Lutheran Church, this limestone structure has a center spire, bell tower and steeply pitched roof with stone finials. The windows are pointed and arched. It has the largest expanse of Tiffany stained glass in North Central PA. Dedicated September 27, 1914, this historic downtown church was been served by 21 pastors and six interim pastors in three different buildings all built on the same corner of ground provided by Peter Herdic. Peter’s wife was a member of the congregation. The present church is known for its beautiful sanctuary and 39 unique stained glass windows. Built 1888, Eber Culver architect. Preservation Williamsport owners. Newspapers and books noted this house on one of the most architecturally important Queen Anne Victorian homes in Pennsylvania . Nothing was spared by Multimillionaire, Edwin A Rowley when he built this imposing structure in 1888. The mansion has just been painted in delightful colors of the era. The carved wood gable, protruding corner bay, projecting dormer and massive turned porch posts provide striking examples of the Queen Anne style. The roof has patterned slate, metal ridge caps, tall, decorative chimneys and large overhanging eaves. The brick has tile insets. Note the delicate wrought iron fence. Late Victorian Queen Ann, completely custom designed with colonial revival influence. The outside of the house is original and boasts many stylistic features not found in the typical pattern book of the time. The house is now a women’s museum of the 1800’s Designed in 1890 by Amos Wagner and built for Henry Johnson, a state legislator from Muncy. Johnson moved to the city to help his six daughters find suitable husbands among the wealthy men of Williamsport. This home represents the Queen Anne style of architecture. The Johnson’s were so please with Wagner’s work they had him build a similar home next door on Maynard Street for one of their daughters! Built 1875, Webber, Culver and Thorn architects. Built with stone from the Bald Eagle Mountain at Muncy and brownstone from Chummiest it has the first nine bell Westminster chimes in America and a mural by Wetly Little. The church was paid for by Peter Herdic and given to Trinity Parish for one dollar as long as the pews remain “forever free”. Note the pointed arches and windows, steeply pitched colored slate roof and 265-foot spire. The church has a multi-gabled slate roof and stonewalls with colored belt courses. There are forty-three arched stained glass windows. The entryway and entry doors are semi-circular. The bell tower is open with a decorative cornice and patterned stone. The center tower was capped when three workers fell to their deaths during construction. The interior has marble altars and Tiffany windows. Built on land donated by Peter Herdic, the local Irish community used Ralston Quarry sandstone to build this structure. Recently purchased by the Miele’s of the Herdic House Restaurant, this beautifully maintained home is now a bed and breakfast. The house contains many original gas light fixtures. Look particularly at the ornate dining room light. Also note the stained glass window at the top of the steps, the rounded panes in the turret and the servant call system in the kitchen. Built 1906 Richardson Romanesque, this stone building has a red tile roof, thick window lentils, large semi-circular arched entries, and three doors with stained glass fanlights. There are many arched stained glass windows. The corner towers have conical red tile roofs. Designed in 1890 by Amos Wagner and built for Henry Johnson, a state legislator from Muncy. Johnson moved to the city to help his six daughters find suitable husbands among the wealthy men of Williamsport. This home represents the Queen Anne style of architecture. The Johnson’s were so please with Wagner’s work they had him build a similar home next door on Maynard Street for one of their daughters! This brick double house was built by Herdic in 1875 to encourage more families to move to West Fourth Street. It has a mansard roof (Second Empire) and a protruding center bay with a copula on top. The West side has arched windows but the East side has rectangular windows. The front porch trims differ. The porches were once mirror images of one another. Built circa 1870 for J. W. Payne, this is one of the few houses on Millionaires Row that has always been a single family dwelling. Take a look oat the chestnut woodwork and the elaborate crown molding in the parlor. There is a servant call box in the kitchen and the second floor sewing looks like oak but is actually painted. Constructed in 1904-05, between the Victorian and the Arts and Crafts Period, this former Doctor’s office and residence is a wonderful example of a town house. Purchased and refurbished by the present owners, the house reflects a resurgence of young professionals wanting to live in the city. Built in 1932 by Harold Tonkin at the “end” of Campbell Street, this home was designed by Carl Tallman, an architect known for custom hillside homes. This ten room house was a quaint French cottage. The original pegged living room has been relocated to the library and the master bedroom. The dining room features a Waterford 1790 candle-lit chandelier. Especially for children is the Phillips collection of carousel horses. Built around 1894, The Arts and Crafts period (end of Victorian Era but maintaining solid craftsmanship) the original residents were the Chambers Family, local furniture shopkeepers. They also owned the first car in Williamsport with a steering wheel and had 2 driveways to their home, one roofed and one for the 3 bay Carriage House. The current owners have lived in the home since 2004. The home has many interior historic features. Built with stone from the Bald Eagle Mountain at Muncy and brownstone from Chummiest it has the first nine bell Westminster chimes in America and a mural by Wetly Little. The church was paid for by Peter Herdic and given to Trinity Parish for one dollar as long as the pews remain “forever free”. Note the pointed arches and windows, steeply pitched colored slate roof and 265-foot spire. Dedicated September 27, 1914, this historic downtown church was been served by 21 pastors and six interim pastors in three different buildings all built on the same corner of ground provided by Peter Herdic Peter’s wife was a member of the congregation. The present church is known for its beautiful sanctuary and 39 unique stained glass windows. The carved wood gable, protruding corner bay, projecting dormer and massive turned porch posts provide striking examples of the Queen Anne style. The roof has patterned slate, metal ridge caps, tall, decorative chimneys and large overhanging eaves. The brick has tile insets. Note the delicate wrought iron fence. The Hiram Rhoads House is yet another house designed by Eber Culver in the late 1880’s for Hiram Rhoads, the man who first brought the telephone to Williamsport. This building is an example of the Queen Anne style, a design that Culver stated in his autobiography, was probably the most successful in his career. This house has many notable feature such as an upstairs bathtub which is encased in mahogany, a solid pecan floor in the living room, and the most magnificent chandeliers in Williamsport. Amos Wagner architect The church has a multi-gabled slate roof and stonewalls with colored belt courses. There are forty-three arched stained glass windows. The entryway and entry doors are semi-circular. The bell tower is open with a decorative cornice and patterned stone. The center tower was capped when three workers fell to their deaths during construction. The interior has marble altars and Tiffany windows. Built on land donated by Peter Herdic, the local Irish community used Ralston Quarry sandstone to build this structure. Again this home was designed and built by Eber Culver in 1887 for Elias Deemer, a lumberman. Another example of Culver’s Queen Anne style of architecture with 17 rooms and cherry woodwork. This stone building has a red tile roof, thick window lentils, large semi-circular arched entries, and three doors with stained glass fanlights. There are many arched stained glass windows. The corner towers have conical red tile roofs. Built with stone from the Bald Eagle Mountain at Muncy and brownstone from Hummelstown, it has the first nine bell Westminster chimes in America and a mural by Westly Little. The church was paid for by Peter Herdic and given to Trinity Parish for one dollar as long as the pews remain “forever free”. Note the pointed arches and windows, steeply pitched colored slate roof and 265-foot spire. Built for Lucy Eutermarks as a wedding gift from her parents in the early 1870’s. Designed by Eber Culver in the Italianate design. The house was originally assigned 913 West Fourth Street, but the brides parents thinking this was unlucky had the house number changed to 915! This Queen Anne style home was built in 1893 for David Overheiser who owned a lumber planing mill on Walnut Street . This was also home to the Mayor of Williamsport in the 1920’s (Hoagland). The exterior features multiple steep pitched gables and dormers, stained glass windows, the original slate roof, and very rare colored slate designs that encompass the entire face of each gable. This house was the first on this particular block of very interesting and original Victorian houses. The interior features all original golden oak woodwork and a very ornate staircase. There are 7 original bedrooms, front and back parlors, fireplace, front and back staircases, dining room, and large family kitchen. The land for this house was originally part of the Mingle Farm which was divided into large lots for housing development as Williamsport expanded north out of the flood plane and into the beautiful wooded area known as Old Oaks Park. The Easton – Carson House was designed by Wagner & Reitmeyer Architect Co. and was completed in the Vallamont Land Development in 1895 for Robert Easton, a supervisor of Williamsport’s Coryell Machine Co. The Queen-Ann home remained in the Easton family for 55 years. The family’s home included one of the first open decks in Williamsport and made use of combination gas/electric lights due to electricity’s reputation as unreliable. Other notable features are the home’s antique chandeliers and 28 distinct wallpapers. This home is featured in the October 2005 edition of Victorian Homes Magazine.